Roof Replacement in Howell Michigan 517-940-8770 | FREE ESTIMATES! Has your roof started leaking and you need roof replacement in Howell Michigan? If so, be sure to call Livingston Roof Pros to have a new roof installed quickly and professionally. We can install a new roof on your home in as little as one day. We are a fully licensed and insured roofing contractor in Howell Michigan and have been family owned and operated for over 20 years. Get started on your new roof installation in Howell Michigan by calling us for a free consultation today at 517-940-8770. We are a full service roofing company. We cover almost all of the roofing types in the Howell Michigan and surrounding areas. If you need a roofing service that is not listed above be sure to give us a call. We offer free consultations on roofing services and can help you get the right service for your roofing project quickly. Most of the homes in Howell Michigan have shingle roofing installed. At Livingston Roof Pros our specialty is shingle roofing and we’re qualified by roofing manufacturers such as GAF and CertainTeed to install a new roof on your home. Even if your home doesn’t currently have shingle roofing installed and you want to have shingle roofing we can help with that as well. We cover many different types of materials when doing roof replacement in Howell Michigan including metal roofing and roll roofing. Plus, we can completely change the roof you currently have and install shingle roofing if you prefer. Want to save some money on your roof replacement in Howell Michigan? Consider re-roofing your home (where applicable). Re-roofing can typically be done to save money on a new roof. At Livingston Roof Pros we offer re-roofing for shingle roofs and can re-roof your home in as little as a single day. For more information on re-roofing and whether your home can be re-roofed be sure to talk with one of our roofing experts today at Livingston Roof Pros. With our free consultation we can answer your questions and give you pricing estimates to make the best decision about your roof. If you want a completely new roof on your home then the best option that we offer at Livingston Roof Pros is a complete tear off and replacement. We’ll remove the old roof down the roof decking and make any repairs to the roof deck. This ensures you can get a perfectly uniform roofing surface with no hidden damage that may show up later. Tear off and replacement roofing is the best option for roof replacement in Howell Michigan and we offer that service here at Livingston Roof Pros. You can also get multiple quotes if you wish to compare the cost difference between re-roofing and tear off and replacement roofing in Howell Michigan. We can usually install your new roof within a day with either option you choose for the roof installation method. It’s always best to start with a roof inspection for your home. Just because you have a roof leak doesn’t mean you need a completely new roof installed on your home. A roof inspection can help you better determine your needs and any options you may have for the new roof that will be installed if needed. Even if your roof is not leaking it’s a good idea to get regular roof inspections done on the home to ensure there are no potential problems that may turn into leaks later. Ready to get started on your roofing project? 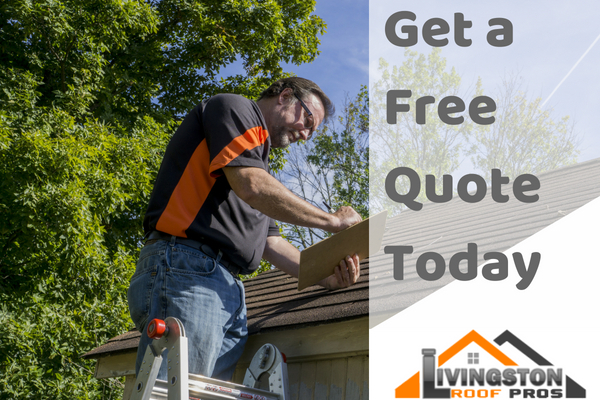 Get started today by calling Livingston Roof Pros for a free, no obligation roofing estimate on your roofing needs. We’ll discuss any options with you as well as answer any questions you may have about your roof. Get started today by calling 517-940-8770 and get started on your roof replacement in Howell Michigan project.